In the U.S. and around the world, e-commerce continues expanding its influence. According to the National Retail Federation, online and other non-store sales grew more than 10% compared to this time last year.1 That strong growth helps explain why more brick-and-mortar retailers want to get in on the e-commerce action. 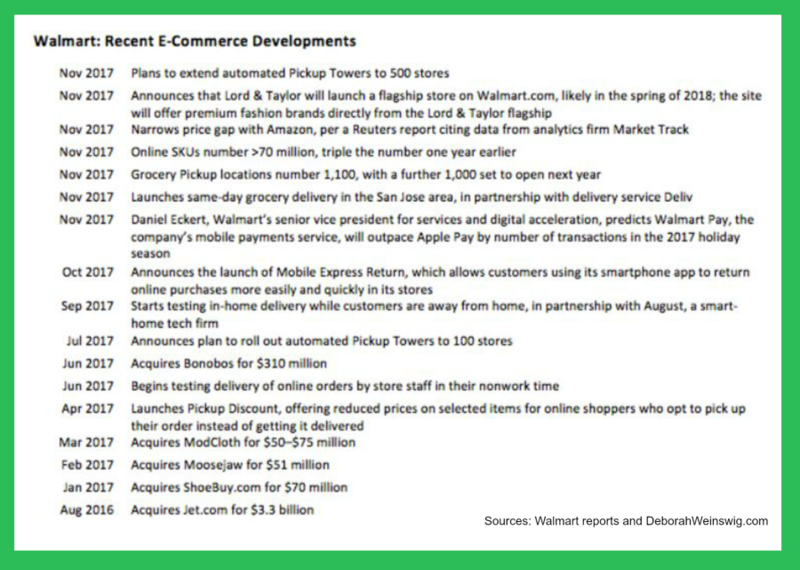 To strengthen its competitive position, Walmart went on a lavish e-commerce shopping spree this year, as summarized in the timeline above.4 The retail giant acquired online grocery and apparel brands Jet.com (in 2016), ShoeBuy, Moosejaw, ModCloth, and Bonobos. Walmart also acquired New York-based, same-day delivery service Parcel, and partnered with Uber, Lyft, and Deliv delivery services last year. Just last week, Target agreed to buy grocery-delivery startup Shipt to compete directly with Amazon and Walmart by accelerating same-day shipping.6 While e-commerce reduces Target’s need for physical stores and overhead, it also increases the retailer’s logistics costs, including fast home delivery. In the beauty segment, cosmetics giant Sephora’s in-store experience reflects online and offline convergence. A digital Beauty Board allows shoppers to browse user-generated content and find products featured in in-store photos.7 Shoppers can even personalize those images to show products most likely to flatter their own skin tone. Even suppliers see the value of online service. To engage shoppers at the individual level, more consumer packaged goods (CPG) suppliers are offering direct-to-consumer service, including Campbells, Hershey, and Kellogg.8910 Direct service allows CPG suppliers to build deeper relationships with shoppers. They can also use their digital presence to gather consumer data insights, which they can then apply to make their marketing more relevant and effective. Balance is important between online and offline service because, despite e-commerce growth, experts expect 70% of retail sales will still occur in stores in 2020.13 To succeed in retail, companies need to consider a phygital strategy and timeline that reflect the needs of their company and their consumers. This entry was posted in *Lead Generation, CPG, Customer Experience, Industry Research, Marketing, Retail and tagged in BOPIS, BORIS, brick and mortar, click and collect, Consumer, convenience, customer experience, CX, e-commerce, in-store, Lisa Goller, lisagoller.com, omnichannel, phygital, physical store, pickup, retail, retailer, returns, sales, shopper, shopping, Walmart.